Was Mewat gangrape and murder an anti-Muslim hate crime or was it motivated by loot? The ghastly double murder and gangrape that took place in Mewat on 25 August may have been an anti-Muslim hate crime. At least this is what the victim family and activists are claiming. At least one of the 4 men arrested in connection case claims to be associated with the Rashtriya Swayamsevak Sangh (RSS). 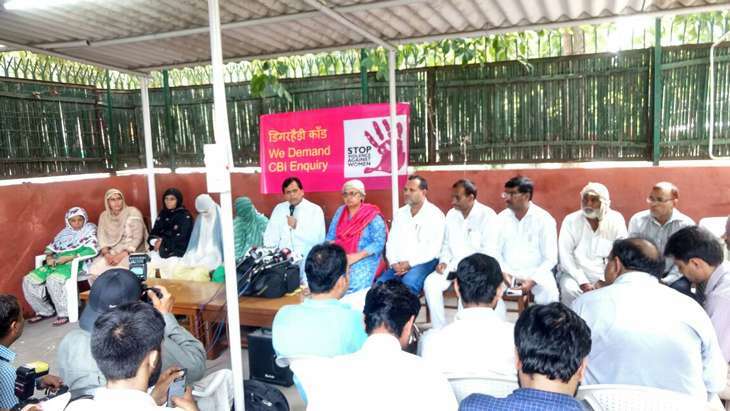 During a press briefing held at the Delhi residence of Rajya Sabha MP Ali Anwar Ansari of the Janata Dal (United), the surviving victims and their family members and activists like Shabnam Hashmi demanded a CBI inquiry into the case. Shaheen Chaudhary, a councillor with the Mewat Zilla Parishad, was also present. They alleged that the police and the administration had been trying to suppress facts and shield the victims. On the midnight of 25 August, a gang of men entered Dingerheri village in Mewat district of Haryana and broke into the house of farmer Mohammad Ibrahim, where his relatives were also sleeping. Ibrahim and his wife Rasheedan, both in their late 30s, were brutally murdered, while two of his nieces - a 16-year-old and a 21-year-old married woman with a one year-old baby - were gangraped by four men. Besides, the teenage girl's father Jafruddin, mother Aisha and two brothers, who were also staying there, were grievously injured. The 38-year-old Jafruddin is still fighting for his life in hospital. The murdered couple had six children, said Rasheedan's sister. The gang also robbed the house, although the recovery is yet to be announced by the police. The two gangrape victims were also present at the press conference. When they were asked about the incident, their brother narrated that they had managed to escape but the perpetrators forced them to come back by threatening to kill the baby of one of the women. They were gangraped after that. Shabnam Hashmi said that in April, one of the accused Rahul had updated on Facebook that he had become a Swayamsevak and is now working for the RSS. About six months ago, an RSS camp was set up in Muslim-dominated Mewat at Sainipura at the Malti-Vatika banquet hall, she said. This is about 2 km from the area where the crime took place. 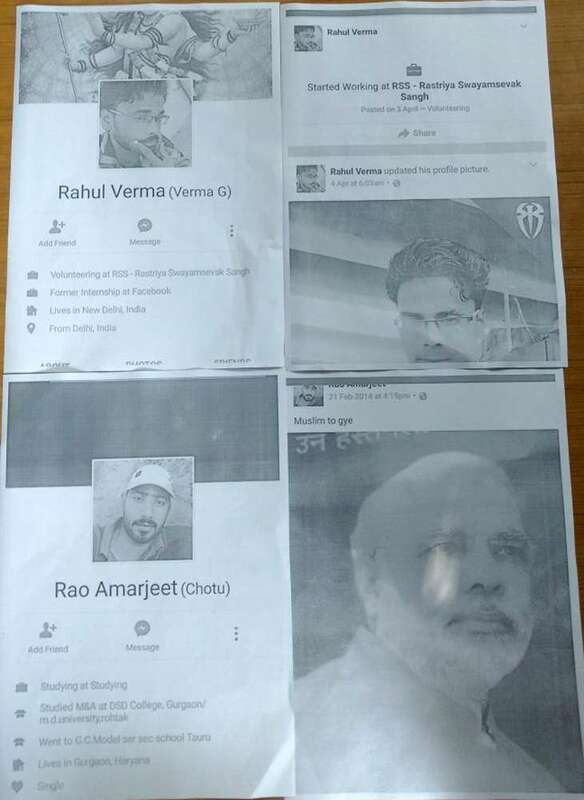 Hashmi said the Facebook feed of another accused, Rao Amarjeet, also had anti-Muslim posts - including a picture of Modi with the caption 'Musalman toh gaye'. On the argument that the incident was a case of robbery, Hashmi said that if indeed that was the case, why were women assaulted with such brutality? She says that it is evident from the Facebook posts of the accused that they harboured deep hatred towards Muslims. Therefore, this can be considered a possible motive behind the crime. Advocate Ramzan Chaudhary of Mewat and some others at the briefing alleged this was a conspiracy to "break" Mewat by the ruling political parties. They said the "peaceful" village had never before witnessed such a crime. Chaudhary said the police, at first, had only registered the case under Sections 459 and 460 of the IPC (related to trespassing), besides Section 376D (gangrape), Section 6 of POCSO and Sections 25/54 under the Arms Act. However, the police took no cognisance of the two murders. Only after facing pressure, the police on 3 September finally added Sections 302 (murder), 396 (dacoity with murder) and 397 (dacoity with attempt to murder or grievous hurt), Chaudhary said. He said Section 307 (attempt to murder) would also be registered once the doctors' reports regarding the injured were out. Mewat falls under Gurgaon constituency, but MP Rao Inderjit Singh - who is also a Minister of State in the BJP government - had not visited the village, nor had the district collector. He said three of the arrested accused belonged to the same Ahir caste as Rao Inderjit Singh. On 28 August, four men - identified as Rahul, Sandeep, Amarjeet, Karamjeet of nearby Mohammadpur Ahir village - were arrested. One of the gangrape victims had seen the men earlier near the Kundli-Manesar-Palwal Expressway on many occasions. However, the gang that entered the house also had four other members who have not yet been apprehended. On 31 August, Haryana chief minister Manohar Lal Khattar of the BJP had a special investigation team (SIT) headed by a senior police officer to investigate the case after pressure by activists. neither the loot nor the weapons used have been recovered. On Wednesday the SIT requested the court to extend the remand of the accused, saying "they (the accused) are very clever and aren't disclosing anything". However, the court rejected the SIT's plea and sent the accused to judicial custody. On Wednesday afternoon, a 11 member delegation met Haryana chief minister Manohar Lal Khattar. According to former minister from Mewat, Aftab Ahmed, the CM has agreed to all the demands made at the 1 September Mewat Mahapanchayat, which included a CBI inquiry into the incident. The delegation also included Nuh MLA Chaudhary Zakir Hussain and Firozpur Jhirka MLA Chaudhary Naseem Ahmed, both of whom belong to the INLD. Questions are being raised over the efficacy of the SIT's inquiry into the crime. The remand paper makes no mention of the motive behind the crime, which is the crux of the matter. The SIT's report says that Sandeep, one of the accused, has hidden the stolen gold in Jaipur while another accused Amarjeet has kept a silver bracelet in Kosi, UP. It further states that Karamjeet left his share of the stolen gold at a friend's house in Panipat. The firearms used have been hidden by Rahul at his sister's place in Najafgarh, says the SIT. Yet, the SIT hasn't managed to recover any of these items. The SIT further states, "Despite repeated interrogation, the accused aren't disclosing anything on these items. They make a claim and then backtrack. The SIT probe is being monitored by a DGP level officer. But even the SIT is facing accusations of conducting a cover-up under the pretext of a probe. In cases like these recovery of the weapon used in the crime and the stolen goods is extremely important. According to Mewat district bar council head Abid Hussain, CM Khattar has agreed to take action against SIT chief Ashish Chaudhary and other officers, in addition to providing compensation and 3 government jobs to the victim family. The government had announced Rs 3 lakh as compensation, which was actually paid by the state Waqf Board from its own funds and not from the Nirbhaya fund, said another lawyer. The family members told Catch that the government had also promised the family government jobs for one son and two daughters, which have not yet been provided. 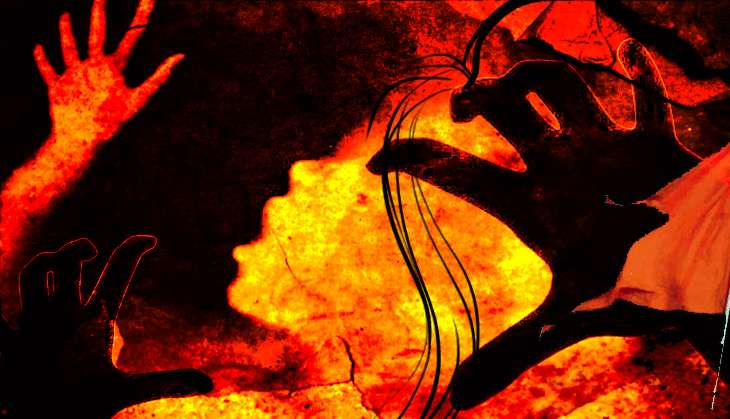 TWEET THIS #Mewat gangrape: one accused calls himself a Swayamsevak on Facebook. Another says "Muslim toh gaye” Was Mewat gangrape and murder an anti-Muslim hate crime or was it motivated by loot?